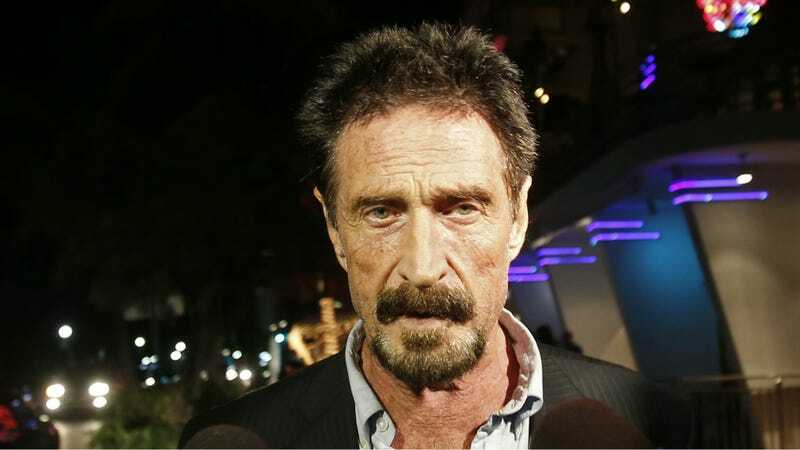 MGT Capital Investment, the penny stock turned “technology company” led by noted liar and trickster John McAfee is crashing on the New York Stock Exchange following a subpoena from the Securities and Exchange Commission. This shouldn’t come as much surprise, considering there’s lots of unanswered questions about the company. The SEC wouldn’t say what its subpoena was about, but the company’s investors don’t seem to care, as they’ve been dumping the stock. Shares of the company have fallen 40%, and law firms are lining up to represent investors who have lost money. It’s still unclear exactly what McAfee’s company really does besides send out press releases. McAfee also had a weird agreement with the company that might make some people think that he’s not in the company for the right reasons. According to a public SEC filing, he was entitled to a $250,000 payout if the stock stayed above $1 for 10 consecutive days, raising to $350,000 once it was above $2 for 10 consecutive days. According to the agreement, that money was to be paid out within 30 days. We’ve reached out to John McAfee for comment and will update this post if we hear back.